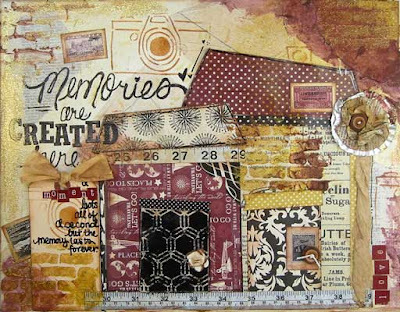 Life at Stamping Details: Memories Are Created Here 11 X 14 Canvas with Suzy West This Saturday! Memories Are Created Here 11 X 14 Canvas with Suzy West This Saturday! You will have fun getting messy while creating a really artsy 11x14 canvas project!! We will be using the new paper line by Carta Bella, texture paints by Art Anthology, Embossing Powders by WOW, Templates by Crafters Workshop, and sprays!!!! The best part – you can turn the papers over and make this project look completely different (colors are black and white). Just add the colors of your choice to it and you've got yourself a new look!!! Extra goodies – mod podge, gesso, embellishments, etc. Please bring to class: scissors, trimmer, adhesive (runner), fast drying liquid adhesive, glue dots, brown color ink pad, distresser, black GLAZE pen, blending tool, embossing gun, embossing pad (Versamark). $37. 72-hour cancellation notice required for refund.